Chris Adams is an internationally recognized new media pioneer, entertainment executive and media, entertainment and technology executive with twenty years of experience in creating partnerships, programs and revenue-generating initiatives between and to the benefit of brands, their customers and users around the world. In 2011, he co-founded Beachball Media (www.beachballmedia.com), a joint-venture partnership with boutique agency Me+Bond (www.meandbond.com) to build a global, digital practice that leverages best-of-breed partners to create and execute on best-of-breed ideas. The company won a multi-million dollar global campaign with one of Australia’s leading energy companies, Linc Energy; led all marketing behind ‘Cowboys & Aliens: The Kids” children’s Application storybook and is pitching brands across the globe and has just won a lucrative contract for a leading real estate development company. His consulting company, Orbit Media Group (OMg: www.orbitmediagroup.com) offers global clients business acceleration, idea and strategy generation plus product execution through its team of top media professionals across sales, business development, marketing and management. Orbit specializes in helping companies achieve greater market-share, revenues and traction through speed, experience and access to decision makers and influencers. OMg’s clients list includes:: www.Facebook.com, for which he helped to create and Produced “Facebook Diaries,” the first-ever hybrid user- generated video/reality TV show distributed on Facebook.com, Ziddio.com, Comcast VOD and the IFC Channel; HBO; Comcast Cable and Interactive; www.Glam.comwhere he built GlamTV; www.Amazon.com, www.Lycos.com and many others. 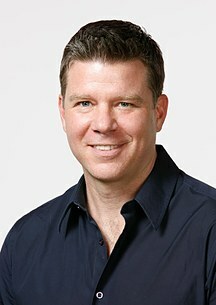 In 2003, Chris joined with eBay’s Jeff Skoll as Chief Vision Officer to help build www.ParticipantMedia.com, serving as the company’s Chief Vision Officer through its first slate of movies: Syriana, North Country, Good Night and Good Luck and the documentary Murderball – were nominated for an unprecedented 11 Academy Awards in 2005. Chris is also proud to have identified and help develop An Inconvenient Truth for former Vice President, Al Gore that, in addition to winning an Academy Award for Best Documentary, contributed to Gore being awarded the Nobel Peace Prize. In 2009 he formed Adams/Kearney (www.adamskearney.com) a film development company with producing partner Steve Kearney which has offices in Los Angeles and Melbourne, Australia dedicated to celebrating Australian ideas and filmmakers at the global level. Adams and Kearney Executive Produced “Jucy,” which premiered at the 2010 Toronto FIlm Festivals and is currently in theaters across Australia and available on Netflix, Blockbuster and Amazon.com. The company has several other projects in development, including the “Evo Gun” documentary with Beyond Entertainment (with whom Adams/Kearney has an overall deal) and several feature film and TV concepts. He is a frequent Key Note speaker with engagements at the V21/AIMIA Conference, AIMIA Connect, The TV 3.0 Conference, Digital Hollywood (both LA and NYC), CTIA, The Opportunity Green Conference, ideaCity, X-Media Labs (Wellington, NZ and Melbourne, AUS), The Screen Producers Association of Australia (SPAA) and the Screen Production and Development Conference (SPADA) in Auckland, NZ and OnHollywood Conference. He is an Advisory Board member of www.Splashlife.comand www.Edgevertise.com, and serves as on the Expert Panel at www.MediaWave.tv.! He is also a resident guest lecturer at Queensland University of Technology in their Creative Industries School where he is working on his second PhD. Born and raised in Pennsylvania, Chris graduated from the University of Denver with a double-major in English Literature and Mass Communications. He received his MFA from USC’s School of Film and TV and his MFA/PhD with honors from USC’s School of Professional Writing, pursuing both degrees concurrently. Chris is also a published childrenʼs book author with the release of his first story: “Sam The Biggest Fire Truck” available as fully interactive iPad application in the iTunes App Store at: http://itunes.apple.com/app/sam-the-biggest-fire-truck/id398932156?mt=8 and serves on the Global Advisory Board of The Global Poverty Project (www.globalpovertyproject.com), which is dedicated to eradicating extreme poverty. Chris lives in Brisbane, Australia with his wife Sharon and their son, Cooper and is an avid surfer, writer and reader. MyHeartwill.com is a special kind of website. Amongst the proliferation of online communities sharing the content, information and musings of daily life, MyHeartwill celebrates this trend in a different way: offering a place where people can protect, preserve and pass on the content, memories, stories and intimate details of their lives, sharing only with those they love and trust most. Leveraging the staples of online social networking - words, photos, video and voice - MyHeartwill evolves these tools from simple communication devices to those that can shape, curate and record the multi-faceted parts that make oneâs life whole. Vimation.com is a video engagement and social syndication platform which enables content producers, networks, brands, agencies and studios the ability to create single-purpose, campaign or programatic engagement products around video. Our proprietary platform not only has elegant and organic engagement and interactivity tools, but also is a world-first and only that enables video containing ads, calls-to-action, ecomm, transactions, subscriptions of any kind to be shared, embedded, emailed, et al to any site - including Facebook, MySpace and Twitter with all monetization, ecomm, ads, et al to travel with the video - therefore no loss of monetization via social media. Developed, helped to create and Produced this first-ever hybrid user-generated content/Reality TV show with Emmy and Peabody Award-winning Producer R. J. Cutler and his Actual Reality Pictures. The series, comprising of 8 half-hour episodes, was made entirely from user-created videos from real Facebook users uploaded to the site from calls to action questions posted on Facebook about their lives, likes and dislikes, experiences, thoughts and feelings. The series was simultaneously distributed day and date on: Comcast Cable and Interactive (both their .net portal and VOD), Facebook.com and The Independent Film Channel. I helped to build Participant Media (www.participantmedia.com) with eBay pioneer, Jeff Skoll based on the vision to leverage the power of media to create social change. The company's first films, "Syriana," "North Country," and "Good Night, And Good Luck" garnished 11 Academy Award and 14 Golden Globe nominations between them and "An Inconvenient Truth," garnished the 2006 Academy Award for "Best Feature Documentary" and "Best Song." The company finances films which have, at their heart, social issues and partners with non-profit groups, foundations and other social institutions to produce online social action campaign destinations wherein audiences who are inspired by the movie can go to get involved. Led entertainment business development including ground-breaking deals around titles such as: "Saving Private Ryan," "Gladiator," and "American Beauty." Led Entertainment Business Development including securing deals for the portal with: Fox (Simpsons, The X Files") and Universal Pictures ("The Grinch Who Stole Christmas"). @Me+Bond is a joint venture partnership with advertising agency Me+Bond and Orbit Media Group focused on generating ideas, providing strategies and managing execution for clients worldwide. The company leverages best-of-breed digital, social media, interactive, entertainment and technology expertise from a global network of top practitioners. Launched in June 2009 http://www.thismagnificentlife.com is about the stories of luxury â the craftsmanship, heritage, history and integrity as well as the things that just make you feel magnificent. We feature stories on the very best places, products and experiences worldwide. A motion picture company based in Los Angeles, CA and Melbourne, Australia with a goal to seek out and celebrate Australian-originated projects to the global entertainment/film industry. We currently have over 10 movies in various stages of Development and our first feature, "Jucy," which both my partner, Steve Kearney and I served as Executive Producers on, will have it's international debut at the 2010 Toronto Film Festival. Orbit Media Group provides business/strategic/corporate development, marketing and sales consulting to its clients all geared toward connecting leading industry brands around media, entertainment content and revenues. Clients include: MyHeartwill.com, Quickflix.com.au, Vimation.com, Budweiser, Facebook.com, Comcast, HBO, Glam.com,Stomp.com.au and Turtle Pond Productions (owned by Tribeca Film Festival co-Founder). Past clients include Amazon.com, Lycos.com, Intel, College411.com. Orbitâs latest project is an interactive childrenâs story application for Apple iOS and Android devices called âCowboys & Aliens: The Kidsâ which is an original story from the creator of the NY Time Best Selling Graphic Novel and movie âCowboys & Aliens." The application takes young readers on a journey through the lives of three boys - a little Cowboy, a little Native American and a little Alien - who meet while playing with their toys and become friends. Available now in iTunes at: http://itunes.apple.com/au/app/cowboys-and-aliens-the-kids/id452170494?mt=8 Every App sold benefits Starlight Children's Foundation.